For 3 days only, Shopbop is offering 30% off these fall pieces! Today I’m all about the shoes…These zipper-detailed booties, these houndstooth flats and these navy + black pumps are all in my cart. Should I buy?! Ralph Lauren has some amazing outerwear selections right now – I’m head over heels for this funnel-collar tweed coat (on sale)! This fur-lined vest and this jacket are also on my wish list, but are a tad more expensive. Ralph Lauren has the best basics! Have you had a chance to check out Tory Burch Home? The collection is filled with adorable needlepoint pillows (I love this one), acrylic accessories (these coasters are to die for) and gilded frames. The collection is definitely worth a look! Last but not least, be sure to check out what I wish I was wearing right now over on The Blue Bijou – Thanks to Abby for the feature! i LOVE those pants and who doesn’t want those valentino shoes? #1 and 6 are gorgeous. 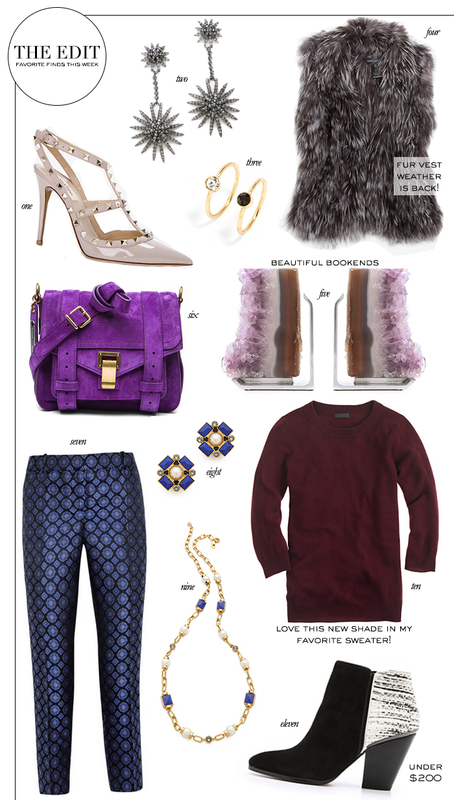 In love with everything on this list especially the fur! Thank you for reminding me to pull out my fur vests again – love those ankle boots!! Yes! I’m SO excited it’s fur vest weather! And thanks again for sharing your wish list! Love those pants and stud earrings! Wore my fur vest today too! You’re my hero for finding adorable midi rings for only $32! Such great picks! Love the bag and those Valentinos! These are some great picks! And those book ends SOOOOO cool! Cute blog following Bloglovin. Get the RM booties! Too cute! I hate fur, but I must admit that vest is gorgeous! If i could have 3, 7 and 11 please :). Lovely edit here.. I would like everything in this week’s edit. Please and thank you! Every time I find pants like the one you have in your list, they never fit and its sad because I love them. That purple bag is gorgeous as well, perfect color combination. I love it all! That fur vest is fabulous! And I love the booties! im all about the fur vest– still looking for the perfect one! I’ve been lusting after the Tippi sweater in cabernet, so perfect for the holidays! the fur vest!!! DIvine….in love with the earrings as well. absolutely love the pieces here! beautiful colors, such chic items! Beautiful curation, as always! Not sure if you’ve tried the Joie flats on yet but I found them to be crazy narrow and I could never get them to break in, ended up never wearing them because of that! But they do look pretty on..